As we head into Thanksgiving week, I am loving the colors of fall. Hunter green, orange, and yellow are just speaking to me! I absolutely love this green Tunic from Firefly Boutique! I told you I love the color, but the sleeves just take it to the next level. The length is perfect for putting over leggings and it is super flattering. Because of the length of this tunic, it is perfect for a side knot! I loved tying this baby up and putting it with jeans. 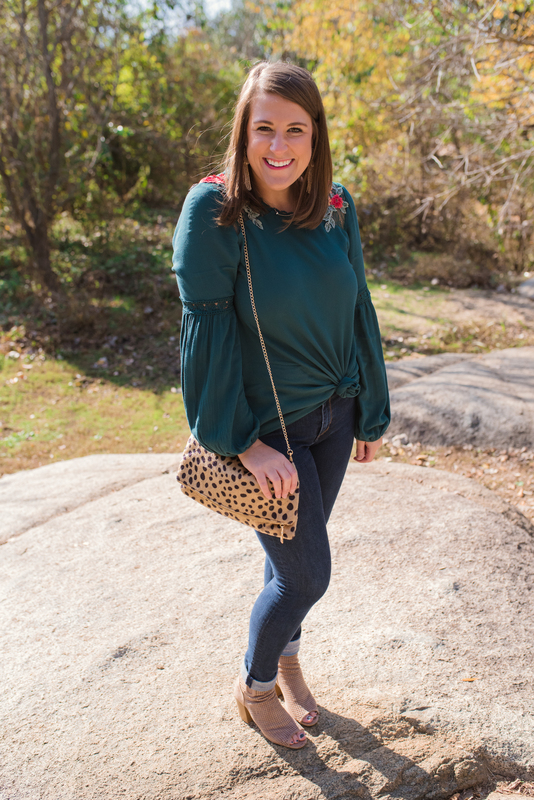 I paired my skinnies with a casual brown, open toed bootie, but this top would look so cute with flare or bootcut jeans too! I just can’t get enough of this tunic! It is packed in my suitcase for my trip to Wisconsin for Thanksgiving. Dustin’s family is all there and Thanksgiving is huge for them! What are y’all wearing this year for Turkey Day?